The best way to describe the sleep of a newborn is chaos, but what looks like chaos has a purpose. You can think of the first few months following birth to be like the fourth trimester — there’s a great deal of growth and development continuing on. This is particularly true of the central nervous system, and sleep plays an important role in that. Starting at about seven months in the womb, babies begin a pattern of brain activity described as REM-like. Rapid Eye Movement (REM) sleep is the active state of sleep when dreams happen. REM sleep is thought to be important for integration of memory and essential for the development and health of the central nervous system — setting up wiring between the brain, eyes, heart and other vital systems. In babies, REM sleep is very active and fitful. Although it is hard to know what is going through the newborn brain, whatever it is, it’s quite a wild ride. They grunt, sigh, twitch and shudder; their breathing rate varies periodically from quickly for a few seconds, to what seems like breath-holding. They rouse from this relatively light stage of sleep quite easily. They spend about 18 to 20 hours each day sleeping, and half of that sleep is REM. 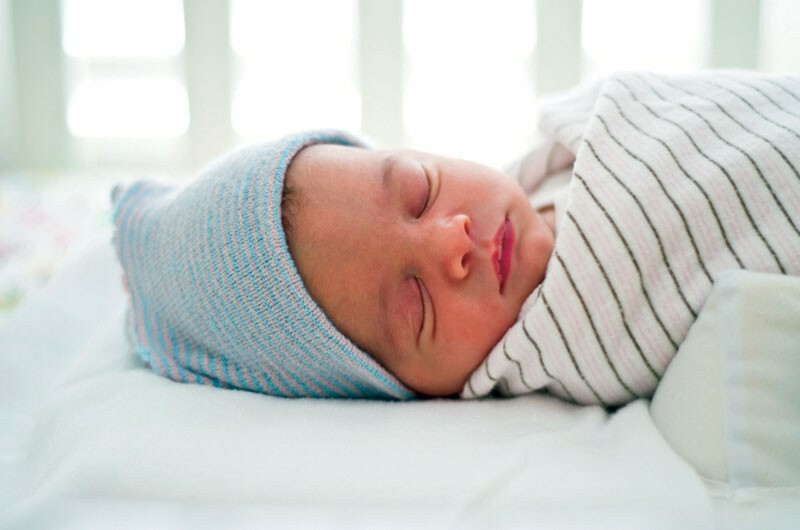 Additionally, one of the defining features of newborn sleep is that rather than descending through quiet stages of deep sleep to the REM stage, the newborn plunges right in to the fitful REM sleep. So life for the parent during the first few months is rough. One parent will likely stay awake holding the baby through the restless REM time. Once baby settles and moves into deeper sleep, he may finally be put down for what might only be an hour or two, only to start the cycle all over again. What can a new parent do to survive the first few months of their baby’s life? Start by offering the baby the breast or bottle every few hours during the day. With their erratic sleep architecture, they will likely be briefly awake every few hours, so you shouldn’t have to wake them up to do this. Hopefully this will also help them get most of their eating done during the day, so they can sleep for two to three hour stretches at night. But realize that babies shouldn’t go more than five hours without eating in the first few weeks of life. To help babies settle to sleep, they may do better wrapped in a light blanket and held close to a warm parent with a familiar beating heart (like the womb). It’s OK to hold them until they are asleep, but then try to get them into their own safe space. The safest place is on their backs in their own crib, on a firm mattress, with no extra toys or pillows. It is safest during the first months of life for them to be in the parent’s room, which is kept at a comfortable temperature, with a binky in their mouths. Parents should try to sleep when the baby sleeps, but try hard not to fall asleep holding the baby — that puts the baby at risk of being dropped or suffocated. Between two and three months, it’s good to start working on a baby’s sleep hygiene. Setting up a bedtime routine that takes a half hour to 45 minutes and includes nursing or giving the baby a bottle, cleaning his gums, and giving him a bath is a good idea. This is also the best time to decide where the baby will be sleeping on a regular basis, and begin working toward getting him to sleep there. After the bedtime routine, put the baby down — sleepy but awake — and give him a few minutes to complain. Then go in and pat him while reassuringly telling him, “Time for bed sweetie, you’re all right, you can do it!” Then leave the room for a few minutes, and repeat, but only a few times before you give in and stay with him a while. Still, try not to pick him up. This is all practice for the next stage, when babies are a few months older and you can get more serious about getting them accustomed to soothing themselves to sleep. Typically, after three or four months, a sleeping child begins consolidating nighttime sleep into longer stretches between periods of wakefulness. Compared to the predominately REM sleep during the early months of life, babies now spend about 75 percent of sleep time in non-REM deep sleep. But what also starts occurring is night awakenings, as many as six times a night. In fact, we all briefly wake up after completion of a 90- to 120- minute sleep cycle. So this is the time when the foundation in selfsoothing becomes important. One of the biggest reasons sleep problems develop at this age is because both parents are not on the same page with helping their baby learn to self-soothe. Perhaps one parent is worried that the other won’t be rested for work the next day, so they hold or feed the baby each time she wakes every few hours. This well-intentioned approach leads to babies who grow ever more dependent on others to soothe them to sleep. So parents need to make a plan to night-train together, knowing it can take a few weeks. At bedtime, continue the routine of the last several months, but now when the baby goes to bed, let him grumble for about five minutes before making an appearance to give some reassuring words and a pat. It is helpful to use a stopwatch, because five minutes seems like forever when your baby is wailing. If you just can’t stand it after 30 or 45 minutes of these intervals, go ahead and stay at his bedside with a hand on him, but try, try, try not to pick him up. During middle-of-the-night awakenings, keep things minimal and boring, but its OK to surrender a bit sooner than with the bedtime battle. The idea is that after several nights of the training in going to bed, a baby’s self-soothing skills will carry over into the rest of the night. And don’t worry. The day will eventually come when you will sleep again. Matt Thompson is a pediatrician at the Kids Clinic in Spokane.